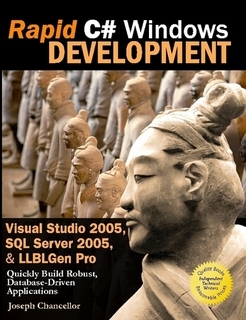 Through the exercises in this workbook, you will learn how to use C# with Visual Studio .NET 2005, SQL Server 2005, and an invaluable tool called an O/R Mapper (LLBLGen Pro) to rapidly develop database-driven applications. You will gain an understanding of the benefits of using these technologies and you will see the complete process from start to finish, including scanning the database schema, generating code, adding business logic, and building the user interface. We will also cover validation, transactions, performance tuning, multi-threading, and deployment. While there are books, websites, and documentation that cover all of these technologies individually, we will aim in this book to demonstrate how they can be used together as a rapid and robust solution.